This all season edition of the popular P7 is designed to ensure optimum perfomance throughout the year and in the long run will save you money in so many ways. Through reduced rolling resistance, and increased fuel efficiency, down to smarter tread compounds that wear more evenly thanks to technology allowing them to adapt to the road surface they're on. Not to mention the cost of replacing your tyres for winter tyres. In the U.K with weather conditions getting more extreme, all season tyres are starting to become a minimum standard which is acceptable to ride on during the winter months. 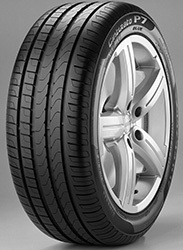 The increased sipes and channels for rapid water dispersion enable the tyre to keep going as winter sets in.